CCTV Camera Pros is an authorized distributor for NUUO surveillance systems. We are partnered directly with the manufacturer to bring you the best price possible. We can supply all NUUO products including NUUO IP Camera Software, NUUO NVRs, NUUO DVR cards, and complete hybrid surveillance solutions for CCTV cameras and IP cameras. NUUO systems are an advanced solution that can grow with your business with support for up to 64 cameras on a single DVR/NVR. Watch our online videos of NUUO software to learn more about the power of NUUO and how easy the software is to configure. Nuuo Surveillance DVR's allow users to access their cameras remotely through a PC (Using Internet Explorer). Accessing your Nuuo Surveillance DVR from a web browser is simple 1: Launch a web browser (Preferably Internet Explorer) on your PC. 2: Enter the IP address and port # of your Nuuo DVR. 3: Then enter your Username and Password. 4) Select the camera that you want to view. Below are screen shots of CCTV Camera Pros office which is monitored by a Nuuo Surveillance DVR. Click on any of the below Nuuo images for a larger image view. Nuuo DVR's now have an iPad app known as iViewer (Available for free in the App store). Nuuo iViewer allows the user to login to their Nuuo Surveillance DVR without going through the Safari web browser or entering in the IP address every time. Logging into your DVR using iViewer is simple: 1) Launch the iPad app. 2) Enter the IP address and port # of your Nuuo DVR. 3) Then enter the username and password. Once the DVR information is entered the first time it is saved on the iViewer app, which enables users to simply click on the Nuuo DVR they wish to view. Below are screen shots of CCTV Camera Pros office which is monitored by an Nuuo Surveillance DVR. Click on any of the below Nuuo images for a larger image view. Nuuo DVR's now have an iPhone app known as iViewer (Available for free in the App store). Nuuo iViewer allows the user to login to their Nuuo Surveillance DVR without going through the Safari web browser or entering in the IP address every time. Logging into your DVR using iViewer is simple: 1) Launch the iPhone app. 2) Enter the IP address and port # of your Nuuo DVR. 3) Then enter the username and password. Once the DVR information is entered the first time it is saved on the iViewer app, which enables users to simply click on the Nuuo DVR they wish to view. Below are screen shots of CCTV Camera Pros office which is monitored by an Nuuo Surveillance DVR. Click on any of the below Nuuo images for a larger image view. Nuuo DVR's have the ability to be accessed using the iViewer Android application. The iViewer app allows users to access their Nuuo Surveillance DVR from virtually anywhere. Logging into your DVR using iViewer is simple: 1) Launch the iViewer Android app. 2) Enter the IP address and port # of your Nuuo DVR. 3) Enter the username and password. Once the DVR information is entered the first time, it is saved on the iViewer app, which enables users to simply click on the Nuuo DVR they wish to view. Below are screen shots of CCTV Camera Pros' office which is monitored by a Nuuo Surveillance DVR. Click on any of the below Nuuo images for a larger image view. Nuuo Surveillance DVR's now offer a remote client software that allows users to manage their Nuuo DVR from a PC. It is compatible with both analog and IP cameras. The Nuuo client software offers live viewing as well as remote playback and backup. In live viewing mode it allows up to 64 cameras on a single monitor or 128 cameras on dual monitor mode. The backup function allows users to archive audio and video both locally and remotely. Below are screenshots of the Nuuo remote client software. The first image shows the backup feature of the client software. Click on the below Nuuo images for a larger image view. Nuuo software, which is included with NUUO IP camera licenses and NUUO DVR cards, supports 6 types of video analytics and event detection. 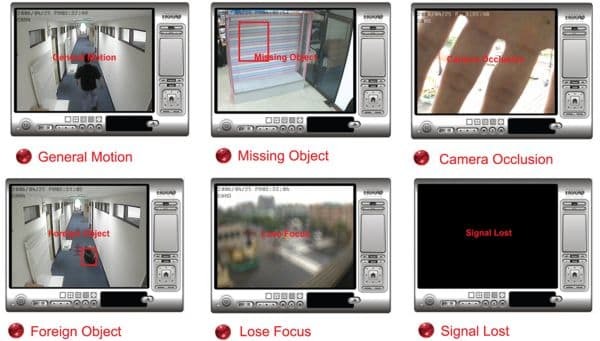 These include: motion detection, foreign object detection, missing object detection, camera lose focus, camera occlusion, and video signal loss. As of NUUO software version 3.3.2, NUUO surveillance systems can be accessed remotely using an iPhone from the safari web browser or via the NUUO iViewer iPhone app. Please watch the below video demonstration of an analog NUUO DVR with an SCB-5008 DVR card being accessed remotely using the built in safari web browser on the iPhone simulator. Please download the Nuuo DVR / NVR Viewer Software and Mobile Apps for Nuuo Main Console DVR / NVR, Mini NVR and Titan NVR. Nuuo iViewer iPhone App - The Nuuo iViewer app allows access to live viewing of the Nuuo Main Console DVR / NVR's, Mini NVR and Titan NVR. Nuuo iViewer iPad App - The Nuuo iPad App is specifically designed to run on an iPad, thus displaying optimum resolution. The iViewer iPad App supports Nuuo Main Console DVR / NVR's, Mini NVR and Titan NVR. Nuuo iViewer Android App - The Nuuo iViewer Android Application allows users to view up to 64 cameras at QCIF resolution. It supports Nuuo Main Console DVR / NVR, Mini NVR and Titan NVR. Don't see the surveillance system to fit your needs? Let us build a customized NUUO surveillance system with you on the phone. Call 1-888-849-2288.